Design Miami 2014: cakes by designers including Viktor & Rolf, Studio Job and Alessandro Mendini were displayed and then eaten during an event hosted in Miami this week by New York gallery Chamber. Chamber, which opened in New York's Chelsea district earlier this year, commissioned six of its featured designers and studios to come up with an idea for a cake. 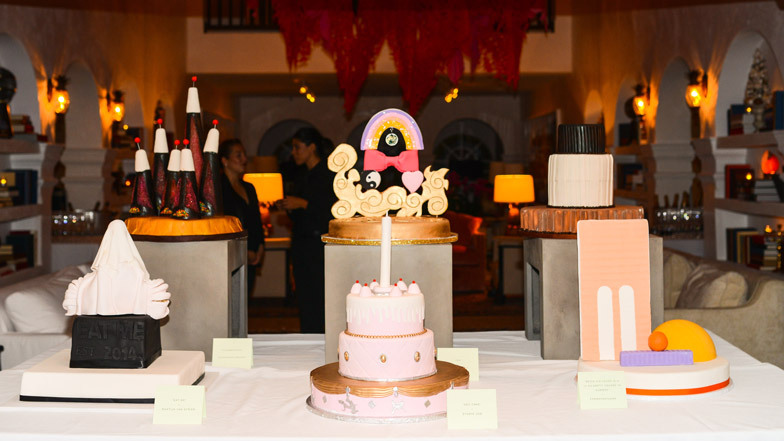 Alessandro Mendini, Martijn Van Strien, Floris Wubben, Viktor & Rolf, Studio Job and Formafantasma all created desserts for the event, hosted at Casa Claridge in Miami Beach on Tuesday evening. Their designs were realised by a team of cake makers including Antonella Tignanelli and Laila Gohar. "Most of the designers specified how they wanted their cakes to taste like," said Tignanelli. Belgian artists Studio Job – the curators of Chamber's inaugural collection – created a three-tiered cake decorated with pink, white and gold icing as well as silver embellishments. A large white candle on top was surrounded by small pink mounds dotted with red balls. The cake design previously featured as the wheel hub of a Land Rover Defender that the studio customised for the vehicle's 65th birthday last year. Three-dimensional geometric shapes, some in pastel colours, topped the simple white base of Formafantasma's design. "The Studio Job cake was mostly pink and white on the outside so we made a strawberry and vanilla filling, and same with Formafantasma," Tignanelli said. Italian designer Alessandro Mendini grouped together six white-tipped conical towers, each with a red ball at the top. "Mendini wanted the base to be tiramisu, and the towers to have candied almonds so we did that," explained Tignanelli. Viktor & Rolf's red-velvet dessert had a gold base patterned with swirls. The Dutch fashion duo stood a Rococo-influenced element on top, which supported a yin-yang symbol, a heart, a bow and finally a rainbow. Martijn Van Strien – another Dutch fashion designer who launched his own label in October – used folds of icing to drape over his monochrome creation. "The Martijn Van Strien cake was a dark chocolate pedestal and then the structure was made out of Rice Krispies to be able to mould it," explained the cake maker. Finally, the cake by Dutch designer Floris Wubben was a stack of three cog-shaped cylinders of different heights and widths. A milk chocolate layer formed the bottom portion, white chocolate was in the middle and dark chocolate covered the top. Guests were able to eat the cakes once they had been admired at the event, which took place during Design Miami – running until 7 December.